It gives me so much joy to participate in the Buy Design for Windfall fundraiser event this year. I get to work with the lovely ladies at Faulhaber, Creative Committee leader Andrew Sardone and so many talented volunteers. Best of all, I got to create the imagery that will be shown on the poster and the website! 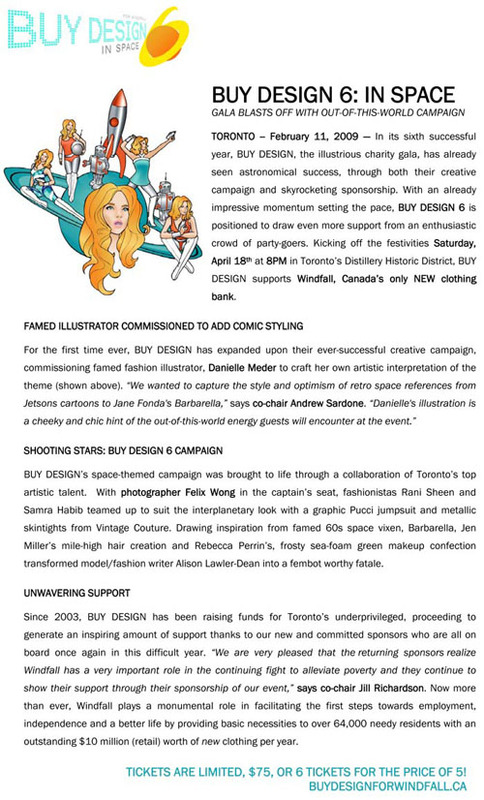 Buybarella is the official muse of Buy Design this year. If you follow her on twitter, you could win a free pair of tickets to Toronto’s most stylish outer space party! Check out the press release below the fold. Man, I love those boots. I love your Buybarella drawings! I CANNOT wait for this par-tay! Barbarella was a fantastic (and funny and strange…)movie! Great illustrations! Nice work for this campaign- looks like it was a lot of fun coming up with the images for the concept! So fun! Pingback: final fashion » thinking – when to contribute pro bono illustration?